Social Impact Bonds (SIBs) are a new funding tool that uses private capital to fund preventative social interventions. A new idea generating high levels of excitement and controversy, advocates see SIBs as a vehicle for innovation, while critics fear that they will be used by government to offload social spending. In fact, it is still early days and the evidence is not yet available to determine their success, failure, threat or promise. This Sector Signal looks at the early experiences of NFP service providers in SIBs and examines challenges and opportunities of the model. 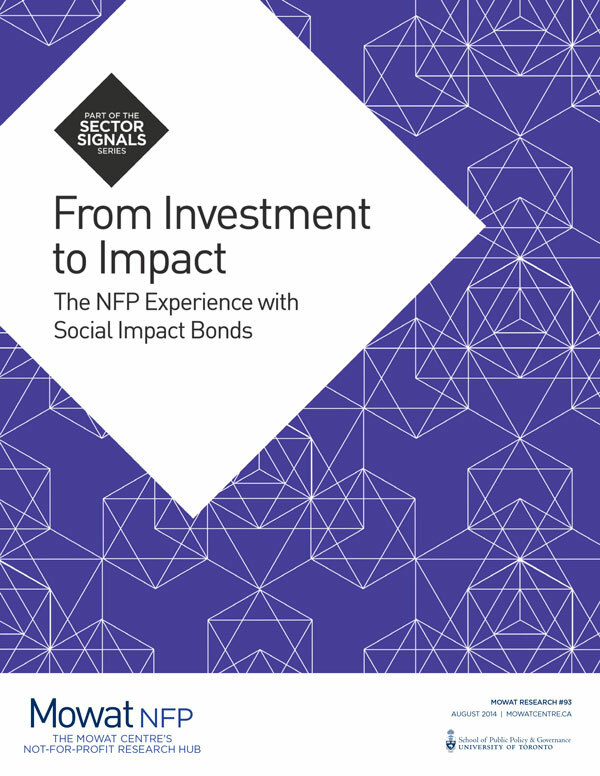 The Social Impact Bond (SIB) is a new mechanism for funding preventative interventions focused on impact and outcomes. SIBs use private capital to fund programs that are not already provided through existing public policy and that have the potential to respond to complex problems and provide long-term savings to government. With only one SIB launched in Canada to date, the idea is new to the funding landscape and has inspired both optimism and skepticism within the not-for-profit (NFP) sector. SIBs are a product of two important trends that have emerged in the provision of public services. The first is the move away from fee-for-service arrangements towards outcomes-based funding and programming. In the context of fiscal constraint, governments increasingly desire demonstrated value for public money spent on contracted public services. ((See Gold & Mendelsohn (2014) for an overview of outcomes-based funding and its associated policy challenges.)) The result has been increased focus on directing resources to those programs and services that deliver the most positive social impact. As these programs are evolving in different jurisdictions, there has been considerable experimentation to find what works for clients, providers and government. The second trend is the growth of social finance in the form of impact investing. There is growing interest in what is known as “double bottom line” investing, characterized by a mix of for-profit investing and promotion of public benefit. Through a structured agreement with government to pay the returns to investors, SIBs are designed to provide this mixed social and financial return to investors. However, questions and controversy surround the SIB model. Critics question whether they are not simply a new way to describe government offloading of social spending. Will better outcomes and cost savings actually be realized through the model? What do SIBs mean for funding to the NFP sector as a whole? Champions of SIBs argue the potential of the tool must be explored as it may offer a way of financing innovative interventions that have proven outcomes but that government is not yet funding. Can they offer a way to improve public programs by scaling successful interventions? Given the first SIB launched in the UK in just 2010, the evidence is not yet available to determine their success, failure, threat or promise. While there are a number of technical guides and briefings that focus on SIBs, particularly for investors and government, there has not been the same focus for service providers. This Sector Signal evaluates SIBs as a potential opportunity for the NFP sector. It explores the early learnings from service providers being funded through SIBs in other jurisdictions and considers how SIBs might be shaped to realities in Ontario. This report is not meant to be a technical guide(( For more information on the SIB development process from the perspective of the service provider, See the MaRS Social Impact Bond Technical Guide for Service Provders, So & Jagalewski (2013). )), but rather its objectives are to examine both the challenges and opportunities of the SIB model and encourage strategic conversations among not-for-profits, policymakers, and impact investors about how this model might best be adapted to strengthen the capacity of the sector to deliver outcomes.